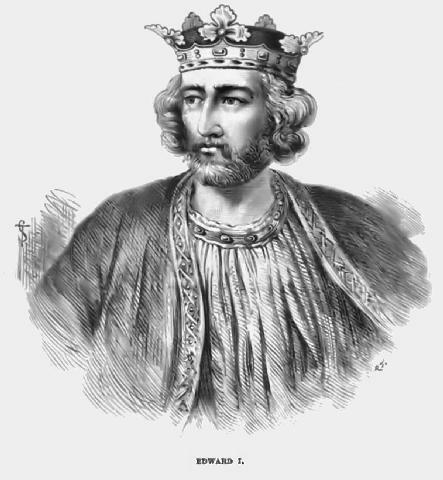 The information below comes from the landmark study by John E. Morris, "The Welsh Wars of Edward I," originally published in 1901. The figures concern the expenses directly associated with the Second Welsh War of 1282/83 against Llywelyn ap Gruffydd. They include two great rolls of payments to the infantry and cavalry as well as the expenses of the king and his headquarters and gross expenses of all the other divisions. The tables below show that the total cost of the war was over £98,000, an enormous sum for the late 1200s. Keep in mind too that these expenses did not reflect the costs of the First Welsh War of 1276/77 or Madoc's War of 1294/95, nor the total cost of building Edward's "Iron Ring" of castles in north Wales, and the repair of existing castles. I hope you find this information useful. Hopefully additional facts and figures relating to this topic will be forthcoming. Stay tuned. 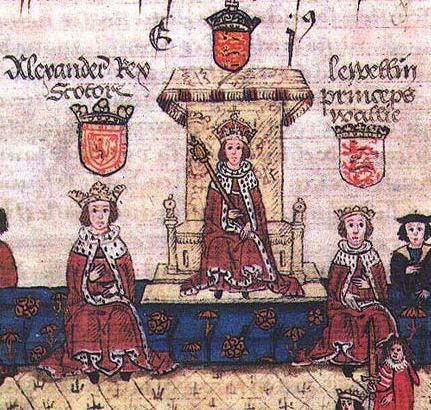 Below: In this medieval manuscript Edward I (center) is flanked by King Alexander of Scotland (left) and Prince Llywelyn ap Gruffydd of Wales (right).